If you own a Staffordshire bull terrier, I don’t need to tell you what a great breed they are. They’re lovable, loyal, and friendly parts of our lives. 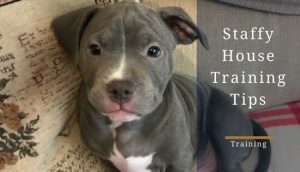 However, there are certainly some headaches that come with being a staffy owner are difficult. For instance, staffies are notorious for their strong chompers and love of chewing; a fact that makes it difficult to find toys for your dog that will last. 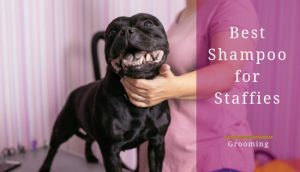 Unfortunately, even the strongest toys can be no match for your staffy, which is why we created this little guide. There are a few toys that can withstand the onslaught of your staffy’s teeth. 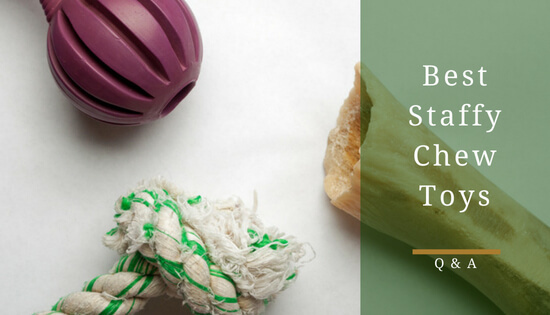 In this article, we have highlighted 5 super-strong chew toys that are up to the task of withstanding your dog’s onslaught. All dog breeds like to have their toys and, for staffies, this is especially true. 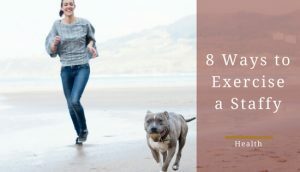 As you know, staffies have a lot of built up energy and need somewhere to unleash that energy. This is where toys come into play. All their pent-up energy seems to come out in the form of chewing all your stuff: shoes, furniture, socks, pillows, etc. Basically, staffies need something to chew on when they get bored. Of course, some toys can’t hold up against your staffies powerful jaw. Plush toys never stand a chance. Tennis balls end up being swallowed or ripped into pieces and can actually be bad for your dog’s teeth. In the end, you find out regular toys just aren’t made for staffies. Don’t worry; this isn’t the end of the world. There are plenty of durable toys out there that can stand up against your staffy’s chewing. So, save yourself pair of shoes or two by investing in a couple of our favourite” indestructible” dog toys below. 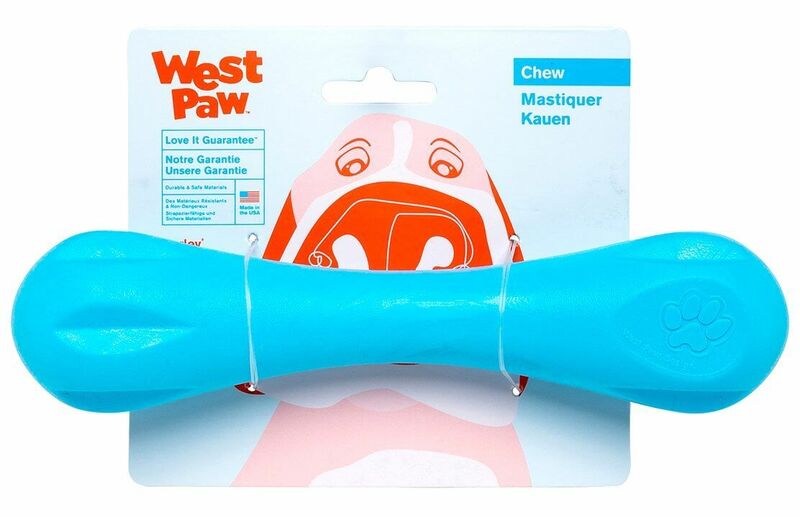 The ​West Paw Design Hurley is a great choice for staffy owners thanks to its durable non-toxic material called Zogoflex. The Zogoflex material is flexible and designed specifically to keep your dog from destroying the toy. Besides the sturdy material, the shape of the Hurley will enthral your staffy. It looks identical to a stick or bone, but unlike those two objects, there’s no chance it will break off and injury your pup. Additionally, it will keep dogs busy for hours with its multiple uses: it floats, you can throw it, and they can chew it. There’s no way your staffy will get bored of this product. Basically, it will keep your staffy occupied and away from chewing things around the home. 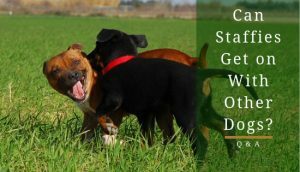 Most importantly, it will give your staffy’s teeth a worthy opponent and give them a challenge. As the name suggest, the Kong Extreme Dog Toy is indeed extreme. This rubber toy will withstand your staffy’s chewing thanks it’s puncture resistance material called Black Ultra Flex. However, this toy’s durability won’t stop your staffy enjoying it. It has multiple functions: you can throw it, put treats inside it or just leave your dog to chew it. Your staffy will keep coming back to this toy and they won’t be able to rip into pieces. A popular idea is to put some peanut butter inside and freeze it to ensure your staffy will be obsessed with this amazing toy. They’ll be busy trying to get the peanut butter out rather than chewing on your shoe or a piece of furniture. All in all, this toy will be a time-consuming piece of fun for your staffy. They are very well-reviewed, pretty cheap and available on Amazon here. The oneisall Bone Chew Toy is another durable and tough toy that will keep your staffy entertained for hours. Uniquely, this toy is bacon-flavoured to make sure your staffy keeps coming back. After all, who can resist the allure of bacon? 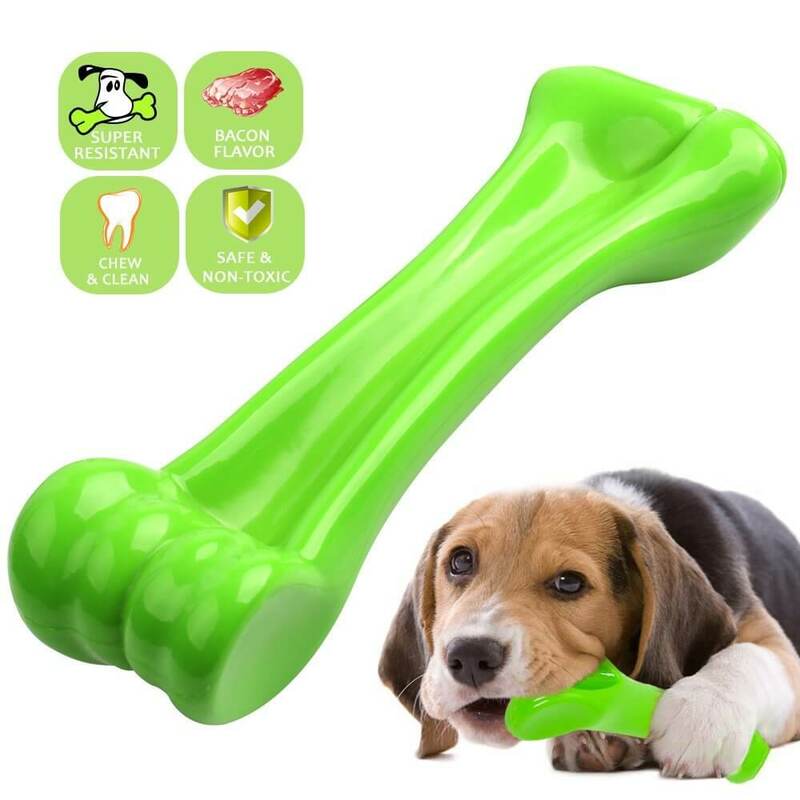 In terms of practicality, this toy is bone shaped, hence the name, and contains all the advantages a regular bone provides. Unlike a regular bone, there’s no chance this toy will break off into little pieces and become a choking hazard. In fact, this toy has some health benefits. For instance, while your staffy chews, this toy cleans their teeth by keeping your staffy’s plaque from getting out of control. 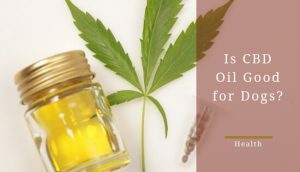 Therefore, it provides entertainment and improves dental health for your dog at the same time. If you’re looking for a bone-shaped toy or something a little unique with the bacon flavour, this is probably the one to go for. A truth any staffy owner knows is your dog needs a ball that can withstand their jaw strength. Honestly, I’ve rarely seen a dog that loves balls more than staffies. However, most balls just don’t have the durability to last long enough once a staffy gets hold of them. 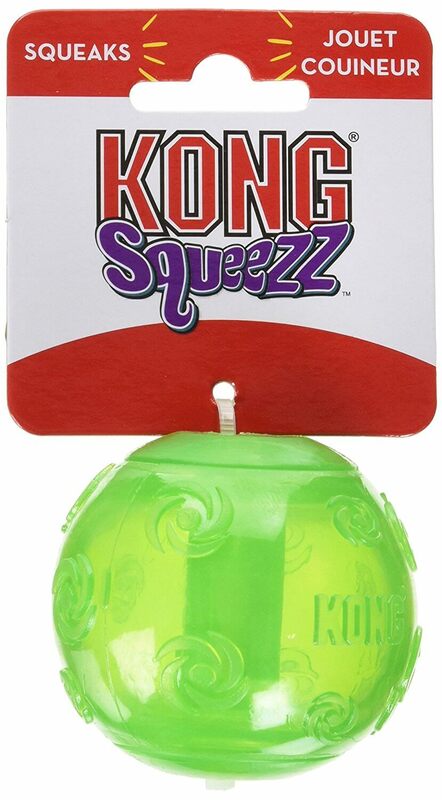 The KONG Squeezz Ball Dog Toy exists and posses the durability necessary to be a fixture in your staffy’s life. As with any KONG product, it’s built specifically to take the burden of the most intense chewers. In addition to its durability, this ball has a squeaker inside. Most dogs love squeky toys. They also have a kack for pulling the squeaker out but that won’t be a problem with this toy. 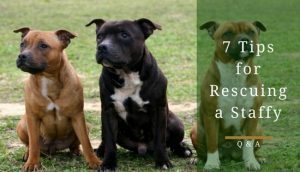 Your staffy will take this as a challenge and spend hours upon hours trying to remove the squeaker, which will allow you to focus on other things than keeping your pup occupied. Honestly, any KONG product would be a good toy for your staffy. They have become the leaders in the indestructible dog toy market. The Nylabone Galileo Bone is another product designed specifically for powerful chewers such as staffies. 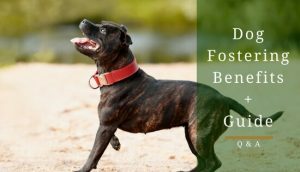 It’s made from tough nylon that will make it impossible for your staffy to break it apart. Again, this toy will keep your staffy occupied for long periods of time. It’s never a bad thing to have toys that consume a lot of your staffy’s time; it’s the key to staving off boredom. Like the oneisall Bone Chew, this product will help clean your staffy’s teeth with its tiny-bristle like raised projections. 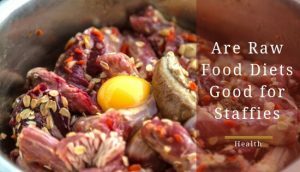 It’s important to fight against plaque build-up since it can cause health problems for your dog. Of course, any dog toy that can benefit your staffy’s health in some way is worth getting.